Some times life contains a lot of “too”, as in “and she cooks too”. The national flower show I was co-chairing blew in like a southern storm, then shone brightly on our city, and left as quickly as it came. It was such an incredible event. We had twenty-six judges come in from around the country to judge over two hundred horticulture, floral design, photography, and conservation exhibits. I couldn’t have been more grateful or proud at how our garden club members came together and pulled off this amazing feat in such a public place in such a short period of time. 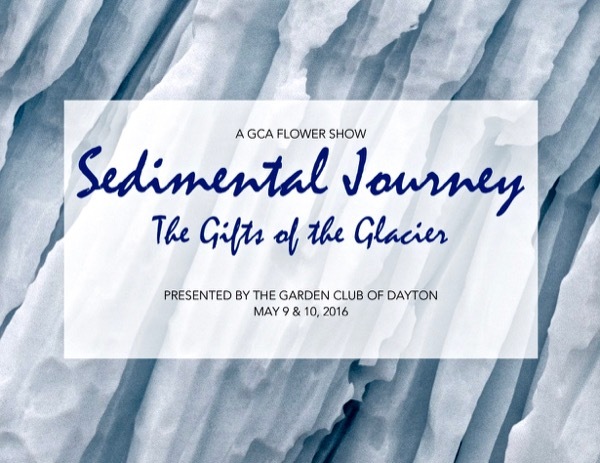 It truly highlighted how we must conserve and protect the great gifts bestowed upon us by the prehistoric glacier that formed our region here in Dayton. Months back as I was rallying the troops and trying to be a good role model I volunteered to enter one of the floral design classes by myself. Later that day the panic set in. I don’t enter floral divisions of flower shows. Then a light bulb went off… I figured that floral design couldn’t be much different than throwing a dinner party. If you put a lot of time and effort into planning and prepping your arrangement, shouldn’t it come off with ease? 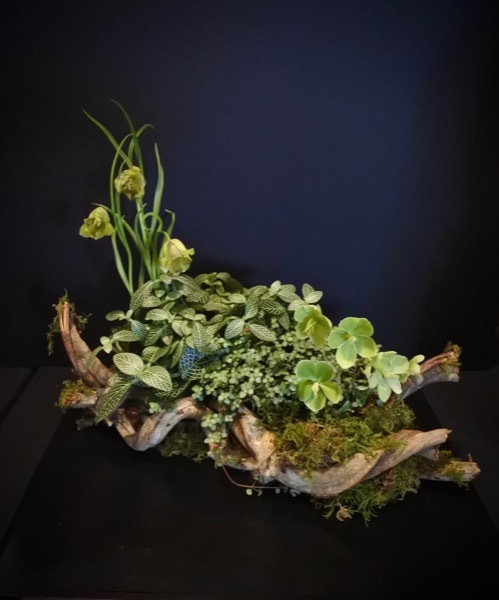 For months I toted around my twisted vines, sheets of moss, and pieces of driftwood on this little tray looking for inspiration. Weeks before the show I felt as though I had it all figured out. Fast forward to 5:30am the morning of our event. I leaped out of bed and started to assemble my arrangement. As I toiled in my pajamas, clipping and snipping and tucking everything into place it looked almost complete. All I needed to do was to place moss around my little pots of pilea, nerve plants, and bags of wet oasis that I had carefully tucked into my vine support. As I opened the sheets, moss flew everywhere. Then I remembered a floral design speaker saying how you should wet it first. So I put the moss into my kitchen sink and then gave it a big squeeze. Like magic the moss clung as though it truly was a vignette in the woodlands. Lastly, I put my sprigs of hellebore and fritillary into my concealed oasis and I was done! I looked at the clock and almost fainted. I had to get dressed; put my arrangement in the car; securely stow the cut specimens that I dashed out to cut in the rain; and find room for all of the boxes and laundry baskets of show supplies. You see we had to set up the entire show the day of the show. I looked around and my kitchen was a fright. Moss, stems, clumps of oasis were everywhere. Then I spied a dog towel. I opened it up and pushed everything into my sink. 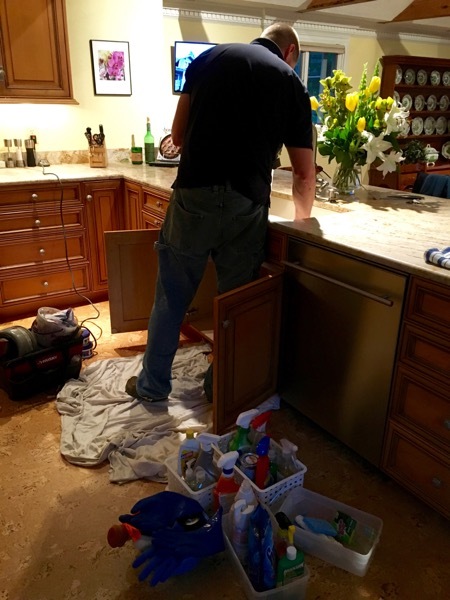 Then ran the garbage disposal. I drove away knowing all would look wonderful for my overnight guests when we all arrived home fourteen hours later. Expert floral designers did I just hear your horrified gasps?? Well obviously I am a novice. So much so, that I won the Garden Club of America’s Sandra Baylor Novice Award for my arrangement. Sandra B. had won the Sandra B?? Well wasn’t that something! If you think it all went to my head, think again. No one should ever put any floral design materials down her sink, ever. 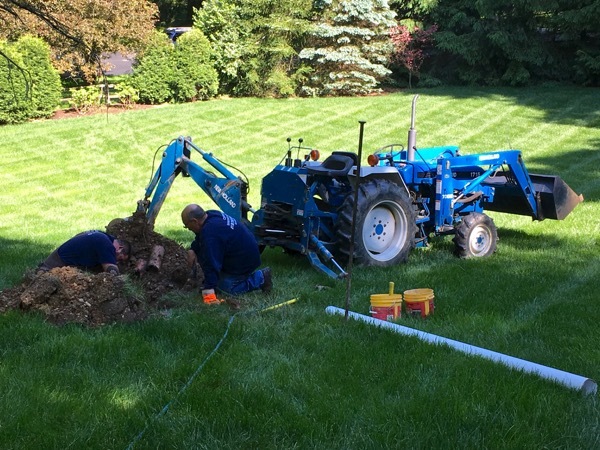 I will spare you the sordid details but thank goodness for the emergency night service of Acme Sewer and Drain. Nelson Sr. and Nelson Jr. of Cooper’s Sanitary said they had never seen such a mess in 48 years. Floral arranging is a very expensive hobby. But how about a truly easy tip about something I’m more skilled at- throwing a dinner party with a minimum of effort. For my judges’ supper the night before the show I wanted to serve up something that seemed fancy but would literally come together in a matter of minutes. I last posted the chopped spring salad I served alongside grilled flank steak. 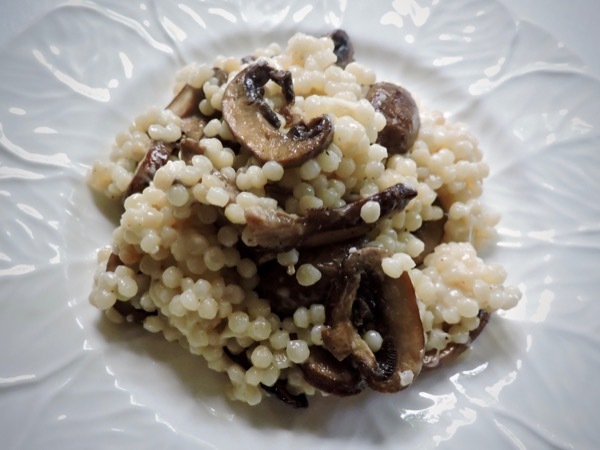 Making time-consuming risotto was out of the question, but I craved that kind of elegant starch to round out the meal. 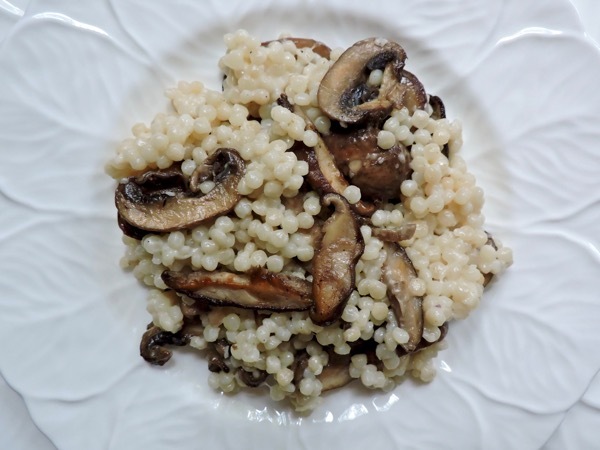 So I whipped together Israeli Couscous with Mushrooms and Jarlsberg. 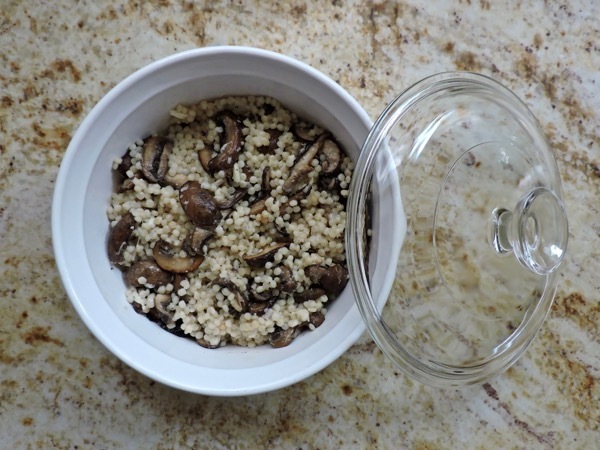 Start with one cup of Israeli couscous. 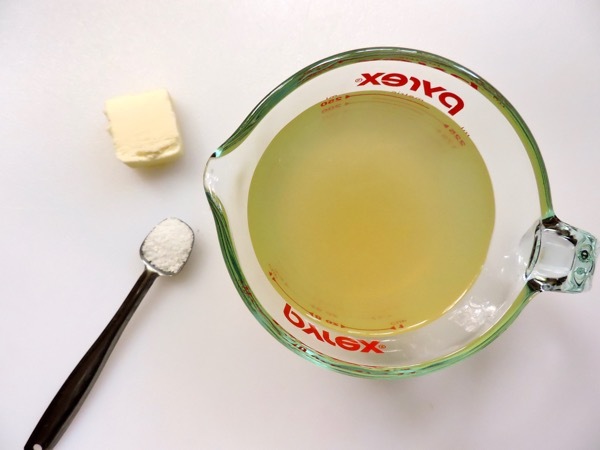 Bring one and a quarter cups chicken broth, one-tablespoon butter, and half a teaspoon of salt to a boil. Add the Israeli couscous. Stir, cover and reduce the heat to medium-low. Simmer for 8-10 minutes, stirring occasionally. Meanwhile stem and slice the mushrooms. 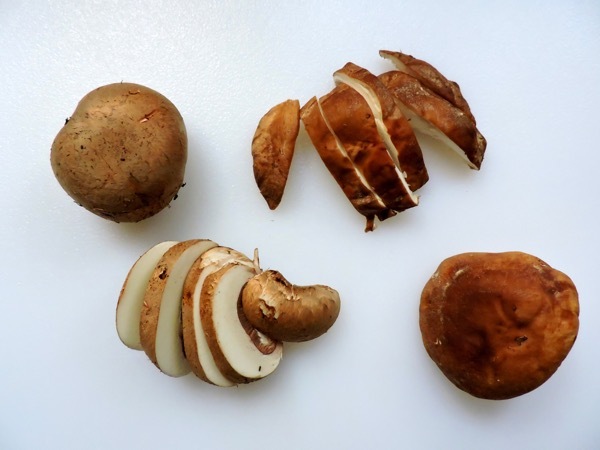 Sauté the mushrooms in one-tablespoon butter over medium heat until the mushrooms shed their liquid and begin to brown on the edges. Set aside. 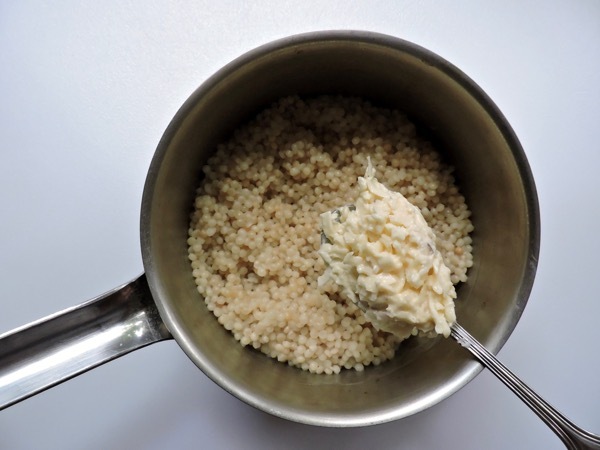 When the couscous is al dente remove from the heat and stir in the jarlsberg dip. 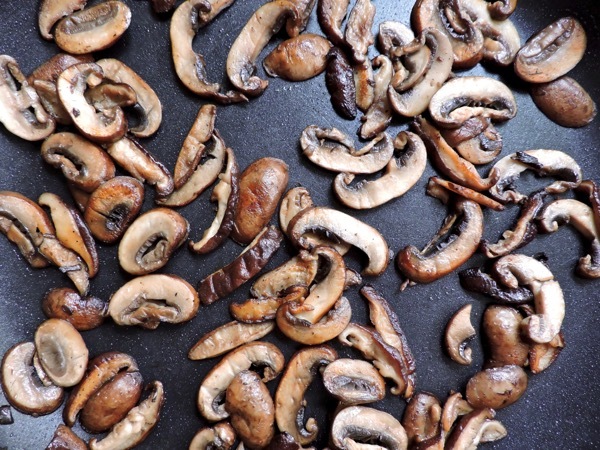 Stir in the sautéed mushrooms. 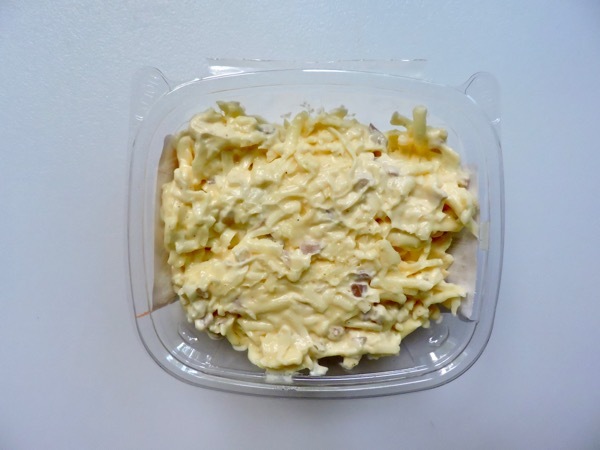 If not serving immediately, let cool to room temperature, cover and refrigerate. 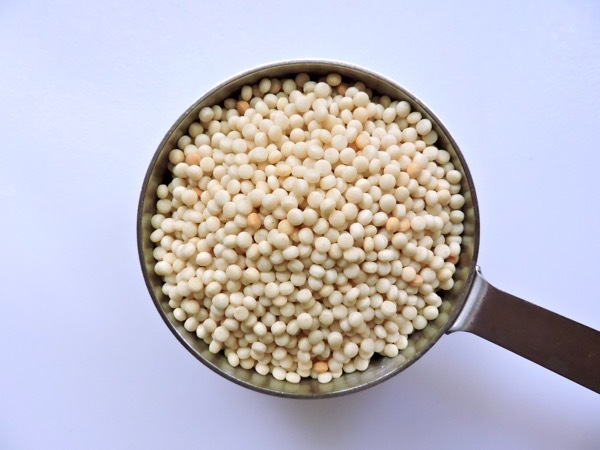 The couscous can be made several hours ahead of time. Warm gently in a 50% power microwave, stirring frequently until heated through. 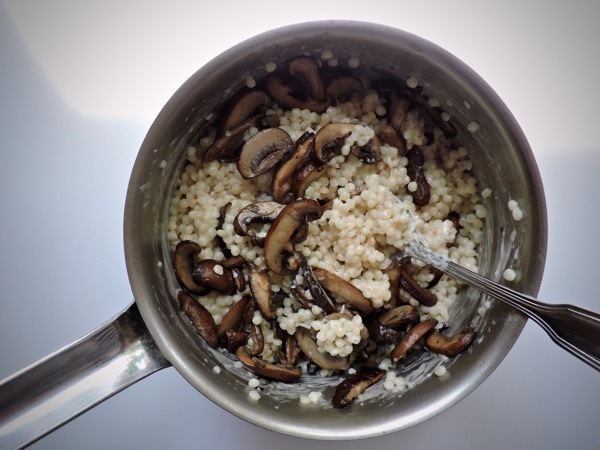 If you cannot find jarlsberg dip substitute ¼ cup grated jarlsberg, imported swiss, or gruyere cheese and when you sauté the mushrooms add one small finely chopped shallot. No one will believe this winner came together in less than ten minutes. My flower show “journey” took a bit longer. And through it all, I imagine you were the epitome of "grace under pressure". Love the arrangement! Of course, your composition skills are impeccable. You had this in the bag. Sandy....absolutely hysterical and the minute I read "down the sink" I thought, "Oh not the wire....or the moss...or the oasis....and certainly not the dog towel". Now, I'm not so sure, but delighted to have the recipe! Loved this post, beginning to end! Congratulations!